Growing up, Jeff spent a lot of time participating in a variety of service projects through his church, fostering a desire to continue to help and serve those less fortunate. Jeff carried this desire with him while in college where he studied Russian and International affairs at Florida State University in the hopes of one day joining the Peace Corps. While in school, Jeff spent three summers in Russia, two of which teaching English at a summer camp on the Black Sea. It was during this time Jeff found a passion for teaching and working with youth. 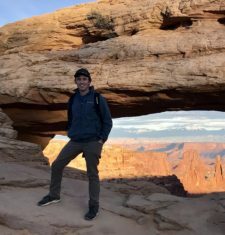 Jeff decided to translate his passions and his love for the outdoors into an AmeriCorps VISTA position here in Moab. Jeff’s official title is Development Specialist and his duties involve writing grants, fundraising, and building program capacity. In his free time Jeff enjoys hiking, rock climbing, snowboarding, surfing, and traveling.